Installing vehicle wraps is a form of art. While some of the vehicle application skills for flat graphics do apply, installing total vehicle wraps is a much greater challenge. In parts one and two of this series, we discussed how to get into vehicle wrapping, how to design for wraps and how to prepare the vehicle for installation. In part three we take an in-depth look at the installation process from start to finish. Read on to learn some well-kept secret tricks of the trade that could help you avoid some potentially costly mistakes. Before you remove the backing of the film, experts suggest taping the design to the exterior to make sure that everything is positioned correctly and falling according to the template. "If you tape up the design you can check what the printer did," says Peter Bearth, director of Spectrum Media Group in Dallas, a division of J Perez Associates. "We want to make sure that the door handles are falling in the right place and that the door breaks are not running through pertinent copy. We do that first." The next step is to remove any elements, such as mirrors or wiper blades that would force you to make extra cuts or unnecessary marks in the vinyl. Inexperienced wrappers tend to lean toward wet applications, but pros say this makes the job much more difficult. "We don’t recommend any kind of wet application for our MPI product line," says Molly Waters, spokesperson for Avery’s technical marketing department. "It will actually break down the adhesive. You may not have a failure right away, but it could fail before its recommended lifetime." It also takes much longer for the actual vinyl to adhere if you do a wet application because the fluid has to dry and conform to the vehicle. Likewise, removing the vinyl is easier if you install it dry. The exception is reflective materials. "Reflective material is very aggressive at installation and it’s even more aggressive at removal," says Bearth. "Eighty percent of the adhesive on the reflective material stays on the car at the time of removal. When people come to me with reflective graphics, I always factor in extra money for time and agents to remove that adhesive because it is a bear." As we mentioned in part one of this series, there are tools that will make the installation process run much more smoothly. A squeegee is an absolute must, say experts, and some installers actually use two different squeegees; a standard hard squeegee for the general work and a felt squeegee for the detailed areas. Felt squeegees help you avoid scratching the vinyl in those hard to wrap areas. "You need a good squeegee that uses a more pliable material because it’s not as likely to get a nick in it," explains Cree. "If you get a nick in the squeegee and scrape it across a graphic, then it’s going to leave a trail or a bubble and makes it look like a scratch mark across the graphic." Experts also recommend an air release, or pin, tool. Inexperienced installers often use razor blades to pop bubble. But this is a dangerous practice because it creates a slit in the film that leads to a stress point and causes the vinyl to give away. "If you use an air release tool or a pin, then it creates a perfect circumference and pops the bubble and you don’t lose the inherent strength or integrity of the film," says Cree. You’ll also need a heat gun to help stretch the film. And both Avery and 3M recommend overlaminates. The vinyl is usually printed on 48" vertical sheets. Manuel Vicnansky, president of DeSignCo, compares it to wallpaper. But even though the sheets are large, the installation should be slow and methodical. Experts say one of the biggest mistakes inexperienced installers make is rushing through the process. Typically, there will be two installers working on a vehicle from back to front, overlapping panels. The hood, rear and roof are done last. "Lay down your rear panel and then your other panel will go over that so your actual overlap is always facing the back," says Cree. "If you were to start in the front and overlap it, then your seams would be facing to the front of the car." Bumpers and body side molding typically aren’t wrapped because the adhesive does not stick to the agents that are in the rubber and plastic. A huge mistake is trying to stretch the vinyl too far, according to experts. "Even though it’s a cast film and it is conformable and will stretch, the trick to vehicle wrapping is to stretch the film as little as possible," says Waters. "If you stretch it too much, then you are actually stretching your design and things won’t line up properly and you are going to have too much film." Working on vehicles that have dents in the body or have been repainted is also tricky because when you remove the vinyl it usually takes some paint with it. That means if you want to pull up the vinyl to reposition it, then you’ll remove some paint, too, and you won’t be able to reapply the vinyl. Wheel wells and deeper recesses also require special attention. Cree suggests making relief cuts in these areas because the film is going to shrink a bit and could pull up. If it pulls up, then it could be subject to moisture getting underneath it and causing a failure. Perhaps the biggest installation challenges are wrapping compound shapes. Vicnansky compares it to wrapping a balloon with a flat medium. 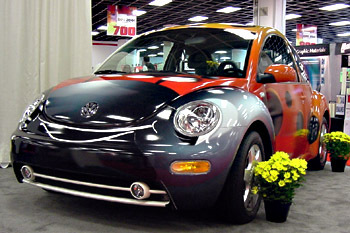 Ironically, VW Beatles, one of the most popular vehicles to wrap, is also one of the most difficult. Transit panel lined vans also present a challenge because there is an indentation, similar to corrugation, that sinks in about one-half inch deep. "One of the biggest mistakes that people make is applying right over the top of that and then trying to stretch the film in," says Waters. "That puts pressure on the film and it tends to want to pop back up. With just a little bit of extra work you can actually apply into that indentation and it stays down very nicely and looks like the material is painted on to the truck." The "little bit of extra work" is heating the film. But there is a right way and a wrong way to do this. The right way, according to Waters, is to heat the film and let it cool. This process relaxes the film and makes it easier to install. Crow’s feet, or wrinkles, as you go around a corner are another typical pitfall. Inexperienced installers often try to heat the film and go around the curve right away, but this only stretches the film and causes more problems. Again, the solution is to heat the film, let it cool, and then go around the curve. "You need to heat it," agrees Cree. "But the problem is that the film, in many cases, has a tendency to tent, or lift, in those areas. Then the film doesn’t stick and if moisture gets down in there, then it will cause a failure. Primer 94 aids our film to be able to stick down better in some of these deep recesses." Windows can be another complication. This requires a perforated window film for one-way vision, so when the driver is inside it looks like a tinted window from the inside but the image shows on the outside. "You have to continue the image from the solid painted metal up through the window," says Art Wollenweber, president of Qube Visual, a Denver-based visual services company. "So then you have to know the size of the windows and print a cut out from the larger file on the perforated material. If somebody pays $1500 they are going to be very picky. Everything has to match." Cutting on vehicle or off? There is some debate whether to cut the vinyl before it is applied or afterward. Vicnansky installs the vinyl and then trims the leftover. "Sometimes you have to cut around the lights, doors, all the rubber gaskets," he says. "You have to be real careful not to cut the paint." But Bearth takes the opposite approach and actually calls the practice a taboo: "I have seen people hack up vehicles like you can’t imagine because they think they can lightly take their razor to make the cuts and they have no idea how much damage they are doing." Avery’s Waters takes the middle of the road stance on the issue, explaining that the best method is carefully trimming the film. "Let the weight of the knife be your guide as far as how much pressure to use. It’s better to make two or three swipes across the material instead of one that cuts into the paint," she says. "A cut could be a failure point when you go to pull the film back because you fracture the paint and it weakens it." With today’s high-tech vinyl, removing is easier than ever before. Experts recommend using a heat gun or a propane torch and then simply pulling it off. "We recommend heat guns as a safeguard," says Cree. "Most good installers use propane torches and are experienced with how hot they need to get the film to remove it properly." Short-term vinyl typically takes about 20 minutes to remove and can actually be loosened by sunlight, while long-term vinyl does require a greater heat source and takes a little more time to remove cleanly. Once again, the key is using high-end vinyl. If you use quality products, then the material should come off easily. If you use cheap vinyl, then expect to be cleaning adhesive off he paint. If you have any requests for more in-depth knowledge on any of the areas that we covered in this three part series on vehicle wrapping, then please don’t hesitate to contact us. 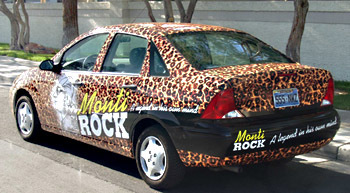 Vehicle wrapping requires advanced skills and techniques. 3M has designed a two-day workshop to help sign makers learn the ins and outs of wrapping in its 3M Installer Training sessions. The sessions are designed to provide basic product understanding and recommended installation techniques for 3M, Scotchcal, Controltac and Comply vinyl films on a variety of substrates. The following are the objectives for a 2-day basic installer-training session. Focus is on basics of films and adhesives and why products are used for what applications. Review key bulletins in binder throughout the days, hands-on applications. Focus is on more challenging applications. The sessions cost $400 and are held in Minneapolis. Upcoming sessions are scheduled, call for details . When Rob started there were no sources of information on how to install vinyl. Rob has taken what he learned in the last twenty years offers customized Hands-On Training and a well respected video training series. The videos are intended for anyone interested in installing vinyl better and faster, regardless of their current abilities. Rob does all of his applications dry. These techniques will help you learn how to avoid bubbles and wrinkles, save you a ton of time and make all of your applications look better and stick better! You can bring Rob right to your own business, to train you and/or your staff, in person, hands-on. This is absolutely the best way to learn how to apply vinyl. Rob is not only an expert at all types of installation, but he loves to teach. You can learn to do it right, without having to pay all of those expensive dues that come from learning the hard way. Rob's fee is $800 a day, plus expenses.